Alcon has launched a new direct-to-consumer campaign to increase consumer awareness of multifocal contact lens options and encourage them to visit an eyecare professional. The “See Near and Far” campaign includes a television spot running throughout 2018 on ABC, NBC, CBS, ESPN and other networks along with national print and digital media. “See Near and Far” aims to reach presbyopes who may already be wearing reading glasses or who are just starting to experience difficulties with near vision. It conveys the benefits patients can expect to experience with DAILIES TOTAL1 Multifocal contact lenses. 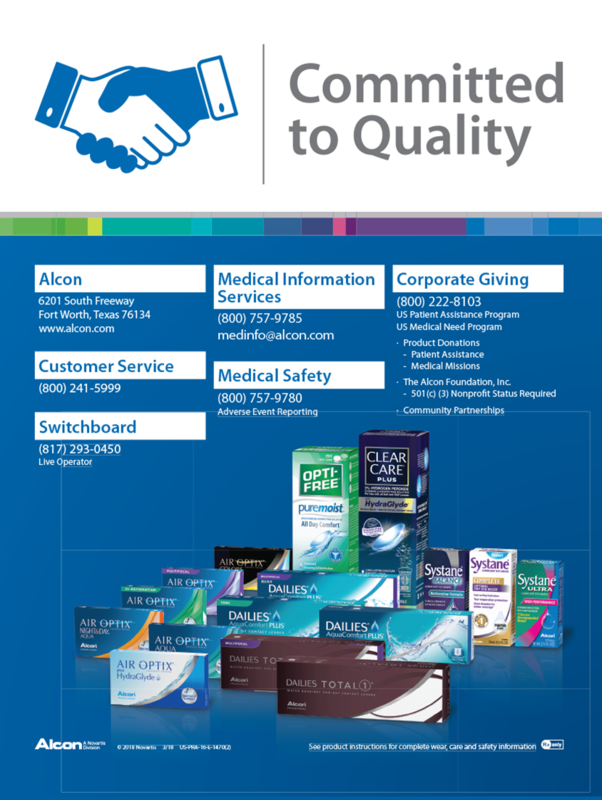 Click here for more information about Alcon’s direct-to-consumer efforts to educate patients. The TrueTear handheld neurostimulation device from Allergan is the first and only FDA-cleared device designed to temporarily increase tear production with neurostimulation in adult patients, offering a novel and innovative way to address inadequate tear production. Using disposable tips, patients insert the device into the nasal cavity to induce the production of natural tears. In two clinical trials, TrueTear was shown to be safe and effective for temporarily increasing tear production in adult patients. Visit www.truetear.com for more information. Sensity Dark and Sensity Shine, the newly launched photochromic lenses from Hoya Vision Care, include all of the features of original Sensity lenses with added processing and performance. Sensity Dark, priced the same as original Sensity, activates behind the windshield of a car and fades back to full clarity. Sensity Shine also activates behind the windshield of a car and offers wearers a fashion-forward look with mirror coating. Color options for Sensity Dark and Sensity Shine — a neutral grey tone, a more flamboyant brown and a lively and slightly intense green — were chosen to provide ideal contrast and glare reduction without sacrificing precise vision. Visit http://www.hoya.com. Walmart and Sam’s Club Health & Wellness presented awards to the winners of its annual optometry student scholarship competition, Project Foresight. Project Foresight, open to students at all ASCO member schools, is a national competition that highlights the Walmart and Sam’s Club Health and Wellness vision of providing quality, affordable, accessible healthcare for all. Two-person student teams were asked to research and present on how Walmart partners with optometrists and how they envision that partnership moving forward. Janelle Sventek and Verle Judd (University of the Incarnate Word Rosenberg School of Optometry) earned first place and received a $15,000 team scholarship and traveling trophy. Carrie DeWolfe and Katie Cargill (Michigan College of Optometry at Ferris State University) were the runners-up and received a $5,000 team scholarship. Stay tuned for the 2018-2019 Project Foresight competition. The -2.75D cylinder power is now available for the entire portfolio of Bausch + Lomb ULTRA for Astigmatism contact lenses, from +6.00D to -9.00D. According to the company, the addition makes Bausch + Lomb ULTRA for Astigmatism contact lens the only monthly planned replacement lens with this cylinder power available in the fit set. Bausch + Lomb ULTRA for Astigmatism lenses combine MoistureSeal technology for comfort and OpticAlign design for stability. For more information on these and other contact lenses, visit the B+L website. Dr. Daniel Epshtein, OD, has added a new white paper to the New Grad Optometry website. A Complete Guide to the Clarus 500 Ultra-widefield Retinal Camera provides insights into the ever-changing eyecare landscape and why more eyecare professionals are implementing ultra-widefield technology into their patient care protocols. Dr. Epshtein has a hospital-based practice where he combines his research experience with the latest clinical strategies to detect sight-threatening disorders early and to provide the best possible treatments. He considers the CLARUS 500, a high-definition ultra-widefield fundus imaging system from Zeiss, to be a crucial component of an integrated approach to the diagnosis and management of ocular pathology. Leading eyecare centers across the country utilize Diopsys devices, which are backed by more than 15 years of published studies. Visitors to the site can conveniently narrow their search for information based on disease state, product and/or resource type. Topcon Medical Systems announced that its DRI OCT Triton Series has received 510(k) clearance from the FDA. The DRI OCT Triton features easy image capture and a 1-micron, 1050-nm light source with a scanning speed of 100,000 A-scans/second. The multi-modal instrument incorporates a built-in retinal camera, eye tracking during capture of selected scans, and combines the company’s years of expertise in OCT imaging, color, red-free, fluorescein angiography and fundus autofluorescence imaging with the diagnostic power of swept source OCT.
For more information, visit www.topconmedical.com. Keeler Americas now offers its Keeler Modified Digital Indirect ophthalmoscope to schools and colleges of optometry. The Modified Digital Indirect is the same unit used by the National Board of Examiners in Optometry for all students taking Part III of the board exam. The unit is designed to combine ease of use with a great view to allow swift examination by students and concise evaluation by professors. For User Support and information about all of Keeler’s products, visit http://support.keeler-global.com/index.html. Marco has introduced a new line of slit lamps, the Ultra M Series, which it says features elegant and intelligent design, progressive engineering and functional flexibility. Attributes of the Ultra M Series include multiple color and blue-correction filters, patented integrated background illuminator, extended slit aperture and wider field of view, and intelligent operator and patient interfaces. For more information on Ultra M Series design enhancements, visit www.MARCO.com. The 2018 winners of the National Vision/National Optometric Student Association (NOSA) grants are Jaelyn DeBerry, Southern College of Optometry class of 2019 ($4,000); Priscilla Chang, IIllinois College of Optometry class of 2019 ($2,000); and Sterlin Blakley, University of Alabama at Birmingham School of Optometry class of 2019 ($1,000). Each year, the grant program recognizes three students who are NOSA members. For this year’s grant program, which was inspired by Simon Sinek, consultant and author of What is Your Why?, students were asked to submit an essay or video revealing their “why,” and explaining their personal mission as a future Doctor of Optometry. National Vision hopes the grants encourage students to continue their work in primary care and to recognize its importance in communities nationwide. Visit https://www.nationalvision.com/ to learn more about National Vision. With the new Cornea Scleral Profile (CSP) Report, the Oculus Pentacam now measures sagittal height, a key parameter for scleral lens fitting. More than 200 Scheimpflug images covering a diameter of up to 18 mm are taken in the measuring process. All images for a Cornea Scleral Profile scan are taken from the same visual axis without the need for eye movement. The usual Pentacam data are also recorded and populated into the displays already familiar to Pentacam users. The CSP scan is a tear-film independent measurement with automatic release. This ensures the values from the CSP Report are as reproducible as all other measured data. A link to external fitting software for scleral lenses is available. Find complete information about Pentacam online. Optos launched Monaco, its new compact desk-top ultra-widefield retinal imaging device. Monaco provides greater imaging functionality and is the company’s first imaging device to combine optical coherence tomography with ultra-widefield color imaging, 3-in-1 color depth imaging and autofluorescence. Click here to learn more about Monaco. Members of the OD leadership team possess deep and unique optometric expertise coupled with years of practice management experience operating their own businesses, all on the RevolutionEHR software platform. They spearhead Rev360’s innovation efforts, work to advance the RevolutionEHR software, and deliver business solutions to customers. Learn more about the team. The application process is now open for the 2019 Student OneSight clinic to a yet-to-be-determined global location next May. The OneSight organization is focused on bringing both sustainable and urgent vision care solutions to communities around the world. On the OneSight trip, optometry students work under the supervision of Luxottica Retail-affiliated doctors performing comprehensive eye exams. They help support a core team of Luxottica volunteers in the frame fitting, manufacturing and dispensing of new eyewear. For the selected students, Luxottica Retail covers the expenses associated with the clinic, including air fare, accommodations and meals. Optometry students interested in participating in a 2019 OneSight vision clinic can apply online. Applications will be accepted through Dec. 10, 2018.